School has begun for many Boulder County kids, but summer isn’t over yet! This weekend check out an eclectic puppet show, dance and play at Planet Bluegrass, celebrate delicious peaches at the Lafayette Peach Festival, make some art, do some rock climbing and so much more. All in and around Boulder! Time: See full schedule here. Cost: $10 for Students and Seniors, $12 for all others. Tickets available here. Don’t miss Colorado native, Sam Reiter, who will be performing Baba Yaga, her production of three Russian fairy tales accompanied by shadow puppets. “Baba Yaga is a show about the Russian witch from folklore, Baba Yaga, who sometimes helps her visitors and sometimes she gobbles them up instead. I would rate the performance PG, entertaining for all ages. If your child can handle Hansel and Gretel, they can handle Baba Yaga.” The Boulder Fringe Festival is an eclectic event that allows audiences to enjoy unique “fringe” artists in a variety of Boulder venues at an affordable price. Tickets for Baba Yaga are $10 for students and seniors, $12 for all others. Cost: $65+, tickets available here, Kids under 12 are FREE. Spend a glorious Colorado summer weekend celebrating songs and stories from around the musical and geographic world along the St. Vrain River at the 27th Rocky Mountain Folks Festival at Lyon’s magical Planet Bluegrass Ranch. The “summit on the song” welcomes our favorite songwriters from folk, rock, country, indie and more including Dave Rawlings Machine, Gregory Alan Isakov, The Revivalists, Lake Street Dive, Elephant Revival, Josh Ritter, Rhiannon Giddens and so many more! Full lineup can be found here. Numerous camping options nearby include: on-site at the festival grounds, along the St. Vrain at the new River Bend Campground (across the street from the Ranch), or under the cliffs at Meadow Park (an easy five-minute walk to the festival). This family-friendly festival is FREE for kids under 12, with a whole host of activities: Tube the St. Vrain River through Planet Bluegrass. Paint, sculpt and assemble in the arts & crafts tent. Build sand castles on the beach. Join the variety of fun, planet-minded activities throughout the day including slacklining, tree climbing, nature studies, a kids music performance, an instrument petting zoo, and much more. Lafayette’s 18th Annual Peach Festival centers around world famous all natural Palisade, Colorado peaches. Enjoy peach pies, peach cobbler and peach smoothies. Food vendors, crafters, antique dealers along with some of the finest artists from the Front Range and Western States will be showcased. Children’s activities, live entertainment and music throughout the day. Over 30,000 pounds of Certified Organic Peaches from Morton’s Orchard’s, Tate Orchards and Red Fox Run Orchards in Palisade, CO. will be available in 4 locations along Public Rd. Free face painting by Face Fiesta & balloon sculpting all day, 9:00am-4:00pm! Bonfils Bloodmobile will be holding a Blood Drive from 9:30am – 3:30pm. Look for the Bonfils Bus on S. Public road near Kimbark Street. Tinker Time at Tinker Art Studio is an opportunity for children to engage in art exploration. The studio offers several stations set up with a variety of materials as well as ideas and techniques for use of materials are offered. Children have complete creative control and enjoy moving freely between stations. Paints, oil pastels, clay, print making, wire and wood sculpture, stamping, cut paper collage… are some of the mediums found during Tinker Time. Parents can drop off their artist off anytime during Tinker Time to run a few errands, take a break at the coffee shop, or stay at Tinker watching their artist at work. All ages are welcome, but if your child is under 4, we ask that a parent or caregiver remain with them in the studio. Tinker Time is limited to 16 students, so if you want to be guaranteed a spot, it’s highly encouraged that you reserve a space in advance. Opening this summer at the Longmont Museum, Dinosaur Discoveries: Ancient Fossils, New Ideas, is an engaging exhibition that will reveal a vivid picture of what living, breathing dinosaurs were really like! Visitors will also get to see real bones from a T-Rex found in Littleton, authentic dinosaur tracks, and a soil sample of the K-T boundary, which shows the point in time 65 million years ago when many scientists believe the asteroid that caused mass extinction of the dinosaurs hit the Earth. Kids can get their hands dirty excavating bones in our dinosaur dig pit, pretend they are part of the Jurassic Period in creative costumes, design their own dinosaur, assemble 3-D puzzles and more. In our courtyard, visitors can feed our brood of chickens – the feathered, living descendants of dinosaurs! Open Gym is a great opportunity for families to try ABC Kids Climbing for their first time. Kids are welcome to explore our facility, with parent supervision, to find the area in which they will have the most fun. 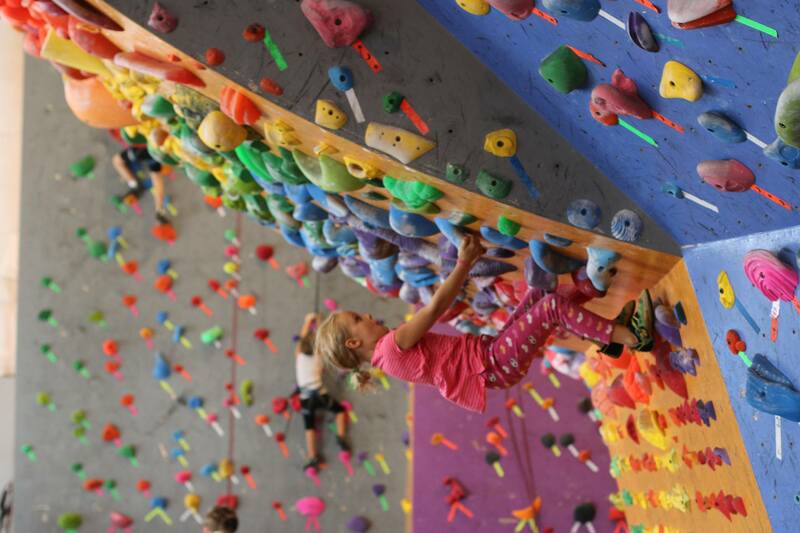 ABC has top ropes, auto-belays, ziplines, slides, and bouldering for kids of all ages to enjoy! No climbing experience? No need to worry! ABC’s expert staff will give all new families a tour complete with rules and basic climbing guidelines to get you started in the right direction. ABC also offers summer day camps for kids – details here.